In addition to nutrition and medicine, you need other strategies for coping with the daily pain and major flares that occur. You have probably experienced something like this before: You go to bed feeling fine….maybe just OK….no worse than usual… And when you wake up in the morning you have some new pain. You roll out of bed. You’re stiff and moving slow. Every step hurts. You think you are never going to straighten up again. And then it hits you that there is some new ache that wasn’t there when you went to bed last night. For some of us, that may just be the aging process. For others, welcome to life with fibromyalgia. 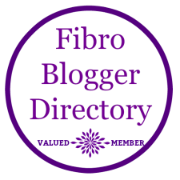 I was diagnosed with fibromyalgia seventeen years ago, in September, 2000. In 2001, September was designated as Pain Awareness Month. Pain covers a lot of different conditions and ailments – everything from arthritis or back problems to Fibromyalgia Syndrome or Multiple Sclerosis to Thoracic Outlet Syndrome (TOS) or Ulcerative Colitis. Often when you have one of these conditions, you have multiple, so the pain is compounded. I suffered with endometriosis for years, then came fibro, TMJ, and now I also have TOS, chronic neck, back, and hip pain/bursitis. Pain – and coping with pain – is a way of life.